One of the more positive byproducts of the information age is the relentless pursuit of excellence in all of our life experiences. We consult YELP reviews before we dine out. We want to know what Rotten Tomatoes says before we see a movie. Travel sites such as Priceline rate the hotels so we know what to expect when we travel, and every conceivable product we might consider buying is rated from one to five stars on Amazon. In a way we have become spoiled, because if we take the time to do the research we are far more likely to be satisfied. We have very little tolerance for mediocrity anymore. So how is this constant search for consumer fulfillment playing out in our churches? Well, if you are in a large suburban church with a lot of resources, you may well be having the worship experience, small group Bible studies, high quality children’s ministries, or whatever else you might be looking for. But what about the rest of us? I grew up in a medium sized church back in the 1970s, and what was happening there was not often compared to what was going on in other churches. Most people were loyal to the Restoration Movement, or to whatever denomination they were involved in. Not much consideration was given to the idea of hopping in the car and driving an extra 10 miles down the road to have a “better worship experience.” After all, your friends and your family were likely there in your home church. Why would you want to go anywhere else? Today, I worship and serve a very average church. We have had our ups and downs. We’ve changed ministers a couple of times. We are limited by our finances, our classroom space, and especially by our lack of human resources—the people necessary to staff the various ministries we are trying our best to keep up and running. And as so often happens these days, another group has done the market research, carefully selected their location, and plopped down a shiny new building with a bigger stage, better sound system, classrooms, fellowship space, gymnasium, and all the bells and whistles that many people seem to be looking for. Add in a trendy sounding congregational name, a dynamic speaker and a rocking praise band, and they’re on the road to success, while at times we just seem to be muddling by. 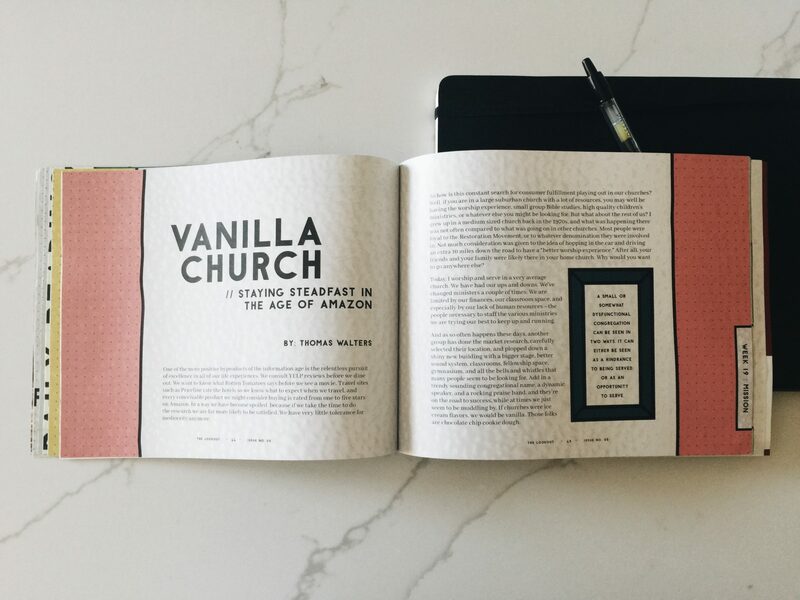 If churches were ice cream flavors, we would be vanilla. Those folks are chocolate chip cookie dough. It hurts us when one of “our” people leaves to go “over there” because the things mentioned above are more attractional than the sound doctrine and solid Bible teaching we are striving to provide. More often than we would like, someone or even an entire family, will suddenly absent themselves from our midst. Being the caring church that we are, we will seek them out with a visit or phone call to find the reason why. Usually their words begin something like this: “I love the people at Small Town Church but. . . .” And all too often we have to acknowledge that there is something to what they are saying, especially if they are looking for more or better programming for their kids. Then there are the moments that we ourselves are restless and tempted to wander off to where the grass looks greener. Should we leave? Do we really have alternatives? If you asked a hundred Christians to name an important quality for a church member to possess, “steadfast” seems unlikely to make the list. It’s an old-fashioned sounding word, with a rather boring connotation. But consider its synonyms: loyal, faithful, committed, devoted, dedicated, dependable, reliable, steady, true, constant, staunch, solid. If Christ were to call us any of those things, how flattered would we be? To become steadfast we must harness our frustration and direct our restless energy. We can begin of course, in prayer. We can pray for our church. We can pray for our minister, our elders, our deacons, and the ministries and missionaries being supported. We can ask God to help us open our eyes. Psalm 146:8 reminds us, “The Lord opens the eyes of the blind. The Lord lifts up those who are bowed down; the Lord loves the righteous.” We may not think of ourselves as blind, but are we clearly seeing everything about the situation in our home church? How well do we know those church leaders we’ve been praying for? What vision has God given them for the congregation’s future? What part of that vision are they struggling with? We can pray that God makes us an instrument that can be used to bring that vision into sharper focus. As God opens our eyes, we can take a hard look at what is already happening in our church. We may find that not nearly enough is happening, but we might also be surprised to find that there are ministries, Bible studies, or other opportunities for growth that we have overlooked or not considered. There are legitimate reasons to leave a congregation and begin looking for a new church home, but is boredom really among them? Remember that there is no such thing as a perfect church. No matter how large the congregation is or how gifted their minister might be, they all have problems, and they all go through seasons when things seem stale and stagnant. If that’s where your church is right now, pray that God uses you to be part of the solution. With the right ingredients, even vanilla ice cream can be extraordinary. First Thessalonians 5:16-18 reminds us, “Rejoice always, pray continually, give thanks in all circumstances; for this is God’s for you in Christ Jesus.” Our steadfastness may be the key ingredient that makes the difference in the flavor of our church. Recently retired from a 33-year teaching career, Thomas Walters is a freelance writer who serves as an elder and administrative assistant at Milan (Indiana) Christian Church.